Producer meetings are a great way to share your business story, bring together people of common interests, renew enthusiasm in loyal customers and gain new customers all in one setting. However, effective producer meetings don’t just happen with a phone call or text to your Area Sales Manager (ASM); they require some advanced planning in order to become more than just another social event. “It’s evolved. The first time I had one as a new dealer, I didn’t even have product on hand and the next day I sold a semi-load of product. Now after some meetings I sell up to eight semi-loads or more within a couple weeks after the meeting,” said Keith Micke, Triangle K Feed at Glendo, Wyo. Micke hosts two large producer meetings each year, spreading them out over his sales territory. He shared some of his what he’s learned over the years that helps make his meetings successful. 1. Schedule in Advance. It is a good idea to get dates on a calendar as early as you can. That way you can start working with your ASM and the marketing team to get invitations designed and mailed, reserve space at a restaurant or other venue of your choice, and make sure the BioZyme® staff you want to speak are available on your dates. 2. Plan your Invitation List. Micke said he likes to invite a mix of both his regular customers and potential customers to the meetings. 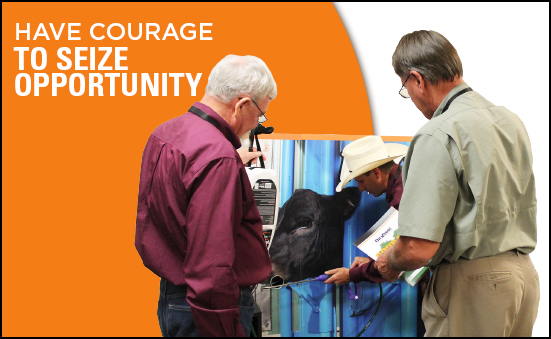 He will ask his long-time customers to share their success stories during the meeting, and it is always good to have a well-respected, prominent rancher in attendance, because he said often a new customer will try the products because he or she wants to be like the neighbor. “That’s really solid. They are getting the information from someone besides a salesman, how the products work and what it’s done for them,” Micke said. Micke said he will send around 80 invitations each fall for his two meetings, where he usually has around 30-35 people at each one. And since ranching is a family business, he also includes the wives and children, as he knows many young families don’t always have access to a sitter. 3. Focus on a Topic. Although there are a lot of subjects a dealer could cover, Micke said he typically picks one topic to cover at each meeting, and then follows the topic by explaining all the products and highlighting any new products or changes. Narrowed down topic subjects might include how Amaferm works or the importance of protein. 4. Educate with Fresh Faces. Micke likes to include outside experts at each meeting. “I get a lot of benefit having my sales manager and a nutritionist there. Then they can learn about the research, and the ranchers know there’s more than just a dealer out there. They bring in a fresh face, a different look,” he said. 5. Be Flexible. Micke said he is always up for trying new things. He originally had two fall meetings and two spring meetings each year. Then he discovered that the ranchers were busy calving in the spring, so he quit having those. He has had some smaller dinner meetings with four or five customers with similar interests. And, at his larger producer meetings, he has even seen ranchers eating at the same restaurant who weren’t invited to his meeting. He pulled them into the meeting, bought their dinner and turned them into customers. 6. Follow Up. At the meeting, you will want to keep track of everyone who attends, either by way of a sign-in card or sheet. Make sure you have their phone number, email or address so you can follow up with them. It is said it takes seven touch points to make an impression. You’ve likely already made a few with the invitation and the interaction at the meeting. Be sure to give them a day or two, follow up, answer any questions and see what products they would like to buy from you. “It’s become a social event for a lot of guys now because they get to see the other ranchers there, and they really enjoy it,” Micke said. Yes, your producer meeting can be effective AND enjoyable at the same time. Remember a worth-while producer meeting is a way to increase your customer base, show appreciation to your existing customers, and be a great educational forum. 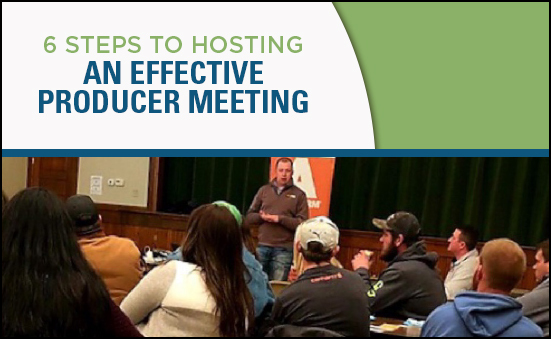 As you make plans for your next effective producer meeting, be sure to reach out to your ASM. Set your goals. Increase your sales. Grow your business. These are all great thoughts; however, do you have a plan on how to accomplish these tasks? A business without an action plan doesn’t really have a plan at all. 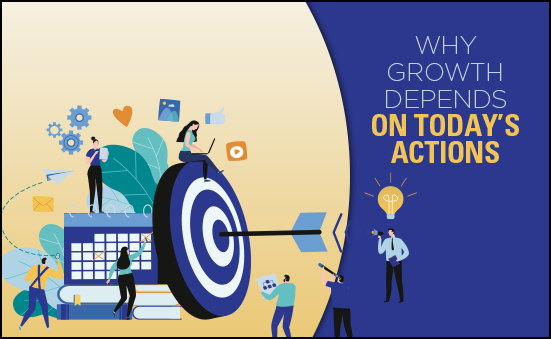 And although creating an action plan might seem like just another thing to add to your growing “to do” list, the steps of creating an action plan are a healthy way to gain another perspective of what your company is doing and hopes to accomplish. 1. To lend credibility. An action plan shows members of the community (and your employees, board members) that your business is well ordered and dedicated to getting things done. 2. To be sure you don’t overlook any of the details. 3. To understand what is and isn’t possible for your organization to do. 4. For efficiency: to save time, energy and resources in the long run. 5. For accountability: to increase the chances that people will do what needs to be done. 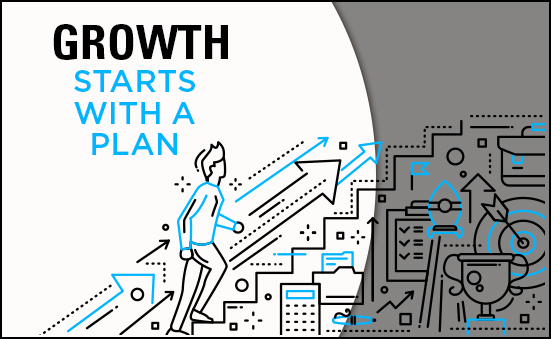 It is wise to start creating an action plan as soon as your business is formed, but an action plan is an evolving document that will change and grow over time. Remember, once it is created, use it. Don’t just stash it away in a folder, never to be seen again. Action plans can be grueling to create. They aren’t going to be generated overnight, and they are going to make you think about the priorities in your company. However, once you have the plan created and have shared it with everyone who works for you, your employees should be more efficient, and will spend more time working on the actions rather than doing tasks that don’t lead to growth or success. Let’s review some key components of an effective action plan. First, outline the clear goals you plan to accomplish with your action plan. When making a goal, make sure it is “SMART,” specific, measurable, attainable, realistic and timely. Next, assign the person, people or team to complete each particular goal. Yes, it might involve others along the way, but these people or teams should be the primary action-takers. Then, list the action steps to be taken to attain that goal and give deadlines for each step. There is some other key information you will need to consider for your plan. What will you need to do to start your action? What are some obstacles that you might face? How will you overcome those? What resources will you need? Do you need sales coach help? If so, who will you reach out to? And finally, list the milestones you will reach along the way. It is vital to have a plan to accomplish your goals. An action plan helps you to stay on task, make sure what you are working on is pertinent to the company and lets everyone know who is responsible for given deadlines. You may even find as you are creating an action plan that a goal you had in mind was actually a task to help you accomplish a greater goal, or it wasn’t part of the company’s overlying mission or vision, so there isn’t a need to spend time on it. As the new year gets started, we challenge you to think about the goals that will drive your success in 2019 and create an action plan to help you get there. We can’t wait to watch your business grow this year! It’s the anniversary dance at a friend’s wedding. The emcee announces for all married couples to gather on the dance floor. Immediately, the newlyweds are seated, being the most recently married. Then in five-or 10-year increments, couples are dismissed by the number of years they have been married. One couple remains, dancing hand-in-hand like they have for 57 wonderfully wedded years. Don’t you wonder what their story is? What is the secret to their success? And now you’re wondering what that story has to do with being in business or more specifically the animal nutrition business. The point is, everyone has a story. Everyone, including you. And it is time to tell your story. According to the Small Business Administration, there are more than 28 million small businesses, making up 99.7% of all U.S. businesses. That makes your story one in 28 million! Do you know your story? Do you have a 3-minute “elevator” speech to share with someone if you were mingling at a party or at a networking function where you didn’t know others in the room? Think about it. What is your story? What makes you unique? And I know there is something unique about each and every one of our dealers. First, determine what your story is. Perhaps, you are an equine enthusiast who became passionate about the products and want to share the products with all of your friends at the barn, show, rodeo, etc… Or, you might be a second-generation dealer who is taking over the reins of the family business – the farm and the feed dealership. Maybe, you are young person who felt there was a void in your “neighborhood” for a high-quality mineral program. Once you determine what your story is and why you’re passionate about helping animals and their owners, determine who your audience is. Obviously, it is your customers. But, there are potential customers in your everyday lives too. Chances are your doctor or dentist has a dog or maybe even a horse. Do they know that you sell a product that can improve the health and well-being of their four-legged friends? And what about the local service organizations? Rotary, Kiwanis, Sertoma. Those groups are always looking for local businesspeople to come share their stories and how they are involved in the local community. Reach out to them to get on their calendar. How will you tell your story? Of course, speaking engagements and one-on-one conversations are great. But you probably won’t be able to talk to everyone at one time so use other methods to share your story. Share it on social media. What do you do at the feed store on a daily basis? Did you go out to a customer’s ranch and take forage samples to send in? Document that with pictures to share on Facebook, Instagram or your business web site. People are interested. They have a desire to know what you are doing and how you do it. Explain the process. 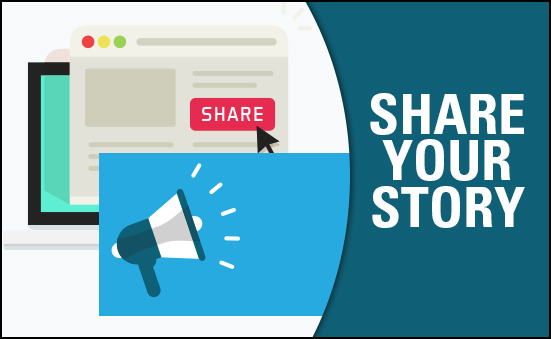 If you have customer newsletter, devote part of that to your story. Or work with your local paper to have a regular column in it to talk about agriculture and animal health – another great way to share what you are doing. No, it isn’t always easy to talk about ourselves. And we might not think what we do on a daily basis matters. But remember, as a business you are one in 28 million. You have a story. Share it with those around you. You might be amazed at the positive feedback you receive. If you’ve ever read the book, “Good to Great” by Jim Collins, you will understand getting the “right people in the right seats on the bus.” Companies don’t fail because they have bad employees, employees that aren’t trained properly or employees that don’t have the right personality. Companies fail because they don’t have the right people “in the right seats.” In other words, they have great employees, but perhaps they don’t have them in positions where they were meant to succeed. Employee turnover is costly. There is no real way to measure it; you have the time and effort it takes to promote the vacant position, another employee has to fill in, resulting in decreased productivity; if the employee that left was one that others liked and respected, other employee morale could be down, also resulting in lowered performance or even causing others to leave their jobs. By the time you replace one employee that already understood your company culture and policies, recruit, hire and train a replacement employee, you are looking at spending thousands of dollars, and potentially having lost revenue due to losses in employee performance. In his book, Collins talks about getting people in the positions that they are best suited for. Sometimes a company will hire someone on the premise that that person thinks they know their skill strengths, but they might not always realize their personality strengths and weaknesses. 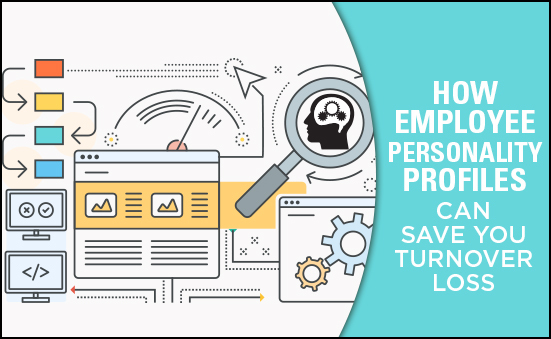 Although personality assessment does take time and money, the investment is typically one that pays off in the end and is less costly than employees leaving and having to recruit, hire and train. At BioZyme, the employees took the Prism assessment. The results revealed insights into the employees “Emotional, Relational and Team Intelligence (ERT-i). This highly relevant and transformative data will provide you with critical information to impact your personal and professional performance, productivity and success.” In other words, the report likely told each individual things he or she already knew. However, it is an opportunity to let others within the company know more about how to work with each other and for supervisors to make sure they have the right people in the right seats on the bus. Prism is just one of many assessments that companies can utilize. There are many options available at a variety of price points. Some come with further training while others provide a report and guidance on how to use that report. Let’s look at this example. For one Ohio-based company, taking a personality assessment helped its Human Resources and Management teams get people in the right positions. They discovered the person they had working the phones in a marketing customer support role was an extreme introvert. And while his degree was in marketing, he had a passion for graphic design. The company moved him into a design position where he could better use his talents and had no interaction with customers. He became very successful in his job. The same company discovered they had an employee who was very outgoing who hadn’t had the opportunity to talk to customers. They moved her into that customer support role, working on the phones. Not only did her career flourish, but customer satisfaction improved too. Employee satisfaction and attrition go hand-in-hand. You can save the time and expense of employee turnover by making sure you have the right people in the right positions. Customers are the backbones of our businesses. They are the reasons we have a business, after all. And many customers are friends first or become good friends over time. They deserve the best when it comes to customer service, and you want to provide the best to them. However, it might be that not every employee you have is programmed to provide the customer service your customers expect. And that is ok. Every person has some strength or strengths that make them a valuable part of your team, and it is important to evaluate those strengths, communicate those strengths to them in the form of affirmation and use those strengths to be an important part of your team. Perhaps you have an employee that is impeccable at cleaning, stocking shelves and maintaining inventory, but finds conversation with others mundane or even uncomfortable. Keep that employee in the back to clean and stock, and only use for customer service if someone needs help loading product. On the other hand, perhaps you’ve hired someone to load out product and stock shelves, that never can complete the assigned task because he or she is always talking to customers and making product recommendations. That person clearly needs to be in a customer service role. Typically, extroverts who enjoy helping others make great customer service reps. But what does this have to do with overall customer satisfaction? Employees who are doing what they are good at, show up and are engaged and will provide better service. Better service leads to increased customer satisfaction. It all goes back to getting the right people in the right positions. Capitalize on employee strengths to make sure your customers have the best service around. 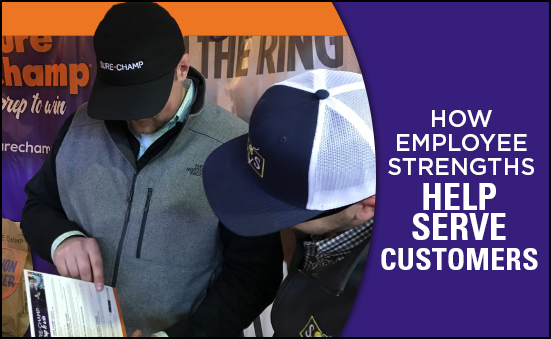 Customers can go anywhere to buy feed and mineral, but make sure they are coming back to your business to get the best customer service that they deserve! 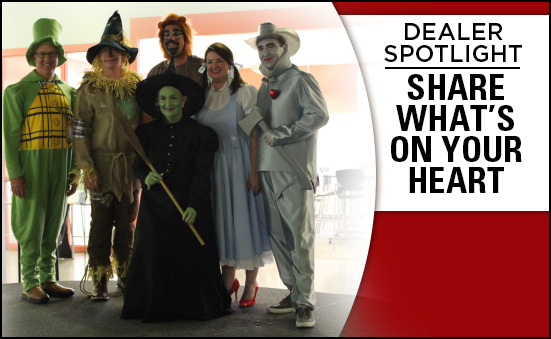 As you journey down the Yellow Brick Road to Success, you’ll find many curves, paths and forks in the road. But when it comes to marketing, you’ll likely take the shortcut. Time and money – two resources that many are short on – often put marketing lower on the list of priorities. But, don’t take that shorter path just yet. In 2017, the BioZyme® Marketing Team compared web site traffic analytics to product sales and found there is a direct correlation between web traffic and product sales. Further, they discovered that getting customers to the Dealer Locator meant more business for you, our dealers. With those findings, the Marketing Team has developed a way to simplify your social media marketing journey, saving you both time and energy, and hopefully driving your sales. Let’s take a short journey down the Promoboxx path. The Promoboxx Social Media platform is one tool that BioZyme has started using recently to offer dealers exclusive digital content for all brands to drive awareness and sales locally, at no cost to the dealer. Because of the agreement between Promoboxx and BioZyme, only a limited amount of “partners” are allowed, so BioZyme is offering this service to VIP Dealers and Master Dealers. social media (Facebook, Twitter, Instagram) or post it to his or her web site. The social content will have a “local” feel, providing more relevancy to the audience. Anyone who clicks through, will go to a co-branded landing page, keeping your customers tied to you, but providing the look and feel of BioZyme’s national message. One South Dakota dealer took what he learned during the hands-on session at Dealer Retreat and applied it immediately, sharing a Promoboxx post about Sure Champ Extreme. That same evening he had a call and an order from a new customer, all because he invested a small amount of time learning about this platform and its benefits. Sometimes, the shorter path is the more direct route, especially when you have national marketing partners that have helped you save both time and money. When you have partners in marketing that have invested time and effort into creative, why would you travel down that road again? 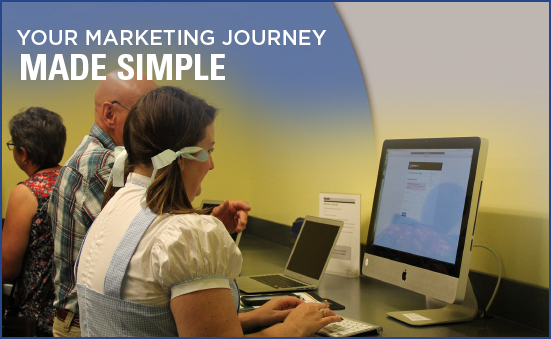 With Promoboxx, your marketing journey just got smoother. To learn more about the benefits of Promoboxx and the eligibility requirements, contact Kristi Stevens at kstevens@biozymeinc.com or (816) 596-8795. As business owners, you have many goals. But your number one goal should be to be profitable. Nearly 95% of all small businesses fail in their first five years because of the lack of profit – now that is a wicked statistic. Turning a profit doesn’t have to be wicked. With proper planning, studying the past and the willingness to make changes when needed, your business can be profitable and successful. BioZyme President, Lisa Norton, shared several key strategies for profitability during a breakout session at the Dealer Retreat. Sales, Revenue OR Income – Expenses OR Costs = PROFIT. Your gross profit margin can be deceiving. Remember it is the difference of all income for goods and services and the total cost of goods sold (C.O.G.S.). Be sure to include not only the cost of the products, but packaging, labor to make the products and other costs associated with the production of the product. By analyzing every profit margin for each product, you will have a deeper understanding of the products that you sell that generate the most profit, and the ones that generate little profit or even worse, lose you money. It is best for your business to stop selling anything that is losing your business money and focus your efforts in promoting and selling the products that create the highest margin. Do you charge all your customers the same amount? If so, why? “It’s true that you might lose a customer if prices are raised, but if your margin is 50 percent, a 10 percent increase in prices means you can lose 17 percent of your customers and be no worse off,” she posted in one slide. Chances are a slight price increase won’t cause you to lose 17 percent of your customers if you remember to sell the value of your products and your customer service. It is vital to know what you have on hand and to use some type of system to track your inventory. If you do have inventory in stock, make sure it is displayed, because if the customers can’t see it, they won’t buy it, and they likely will move on to your competitors for another product. When getting in new inventory, remember to rotate your stock and use the FIFO system – first in, first out – because no one wants to buy an old product. Now, you might think tips about profitability shouldn’t mention “cutting” money, but Norton used a great visual with play money to demonstrate how to “cut” expenses from your profit equation. Each person in the room had one dollar to spend, and they had to decide how to spend their dollar on marketing, by cutting it into sections. Would you spend half your dollar on print advertising? Cut it in half, and you have half a dollar to spend on digital efforts, radio, creative design, research, boosting social media posts. How far will that half-dollar go? Because once you spent that first half, you can’t get it back, and if you are going to be profitable, you can’t ask for another dollar. It shouldn’t surprise anyone that most people in the room, “cut” their money in different ways. That’s because everyone’s businesses are different, and everyone has different strategies to meet their goals. 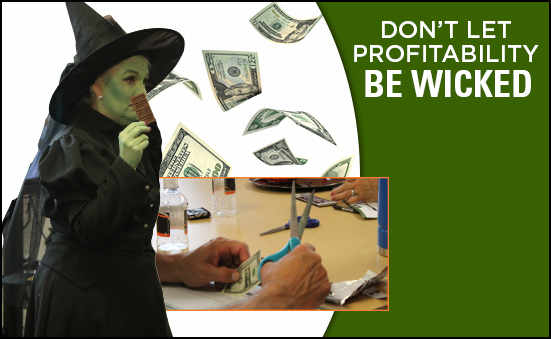 Being profitable doesn’t have to be wicked at all. It can be a challenge that you face with courage and resolve. Follow these five simple steps and enjoy your journey to profitability. Every one of us has a bad day from time to time. The same is true for our livestock and companion animals. Part of being in the animal nutrition business is being able to offer potential solutions for when those bad days happen for our customers’ animals. That’s why it’s important to keep some of the most unique products BioZyme® offers top-of-mind. The Vita Charge® line and Vitalize® Recovery Paste are some of the company’s fastest growing products and offer the highest profit margins to dealers. And, they offer a rapid response to animals’ stress, making them a great product to showcase how effective the Amaferm® advantage is. Due to the quick response rate of the Vita Charge line and the Vitalize Recovery Paste, they build customer confidence and open the door to more conversations about other products, that ultimately lead to bigger sales. As a dealer, you must have the courage to keep these products in stock and even offer a sample to a customer who has an animal in need. That tube of Recovery Paste or bottle of Liquid Boost® might be the best investment you make in marketing, if it leads to a loyal customer who starts buying and using more products on a consistent, year-round basis. One example of a customer that started with one of these products is Brenton Feedyard at Grimes, Iowa. The feedyard was first exposed to the Amaferm advantage with Vita Charge® Stress Tubs in its receiving pens. The feedyard has been using the Stress Tubs for five years now, and typically puts two of the 200-pound tubs in the larger pens that hold up to 120 calves, and one 200-pound tub in the smaller receiving pens that hold 40 head. Although the calves only get Amaferm for the first 30 days at the feedyard, Keller said it has helped the calves get started on the right foot. They are overall healthier, and he says they treat on average, 50% fewer calves – a big labor savings for an outfit that feeds 3,000 head, farms 2,000 acres and only has three employees. “When we get more Amaferm into the gut, we are getting more health into the gut. Some of the cattle are in rough condition when we receive them and just learning to eat. Most cattle that don’t go to the bunk will still go to the tub, and that’s what we like about the Stress Tubs,” Keller said. Keller is just one example of a customer who learned about Amaferm and keeping the gut healthy, thanks to the Vita Charge Tubs. Now, he is a believer, who keeps ordering more product. One of the greatest things about Vita Charge, is it can be used across species. The various applications for each production scenario, along with the rapid response make it a great “starter” product or door opener. Be courageous. Offer a solution for a stressed animal and watch your customer list grow.